Taiwanese electronics company Asus is trying to make it easier for crypto miners by introducing a computer motherboard built specifically for handling the complex calculations necessary to dig, so to speak, for digital tokens. The new motherboard, unveiled on late May, will support up to 20 graphic cards, or the hardware that lets computers produce advanced videos and images, that are essential to crypto mining. Additionally, it says the design makes it easier for users to plug in USB riser cables directly into the printed circuit board (PCB). Many crypto miners build their own computers and the motherboard, one of the principle components of a computer, is an essential part of that process. Asus claims that its motherboard will shorten the time it takes to set up for mining while also reducing the chance of inadvertent disconnects common in other boards and make diagnosing problems easier. “Less time maintaining your machine means more time mining with it,” Asus said in a statement. The motherboard will be available sometime between July and September. Although Asus has not yet disclosed the price, according to tech news site The Verge, the motherboard should be in the same $50 to $400 price range of similar boards made by other manufacturers that are already on sale. This is not the first time Asus has dipped into the cryptocurrency mining market. 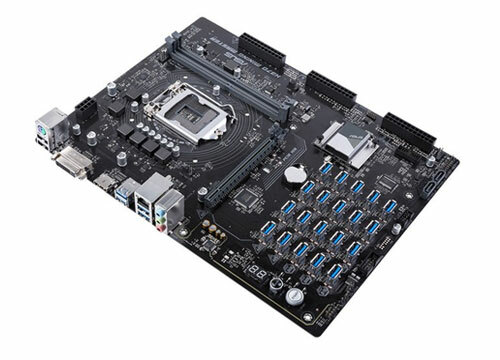 In September, the company launched the B250 mining expert motherboard, which now sells for $141.98 on Amazon. Asus says that it used what it learned from its original motherboard to update the design for this latest launch. “With the concept proven in practice and more insight gained on what miners need, we redefined the formula for a second generation,” said Asus.